On September 3, 2010, Indian batting ace, Sachin Tendulkar was awarded the honorary rank of group captain by the chief of the Indian Air Force (IAF) for his contribution to cricket. Instead of an honorary award, what if he really was a group captain in the IAF? 1. Tendulkar will be the first airman to fly 200 sorties in one day. Everybody knew from the day he entered the Indian air force and started flying them planes, he was gonna be the one to break the 200 barrier. Some thought this day might never happen and have to live with the fact that a Pakistani group captain had the record for the most number of sorties in a day. 2. 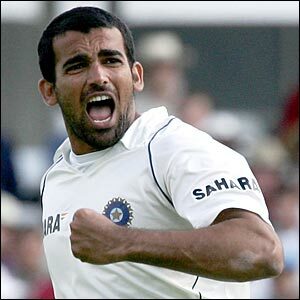 When Tendulkar enters the peak of his prowess as a true dog fight legend, his wingmen would be extremely terrible. They would be so inept that they can’t even do the one job that is asked of them — hold one end up with some fake firefight and pretend to shoot at the enemy here and there. 3. For the majority of his flying career, he would be saddled with hand me down jets from the previous era which malfunction constantly with failures at the most inopportune times. During an epic battle against an archenemy, he would get 136 kills over the skies of Chennai and leave the rest of the squadron to shoot down just 17 more, as his back engine was fouling up but alas, that wouldn’t happen! 4. In the “Battle of the Hero Cup”, when senior and more experienced fighter pilots like Devil Kap were dithering over whether they could deal the deciding blow, Young Tendulkar would volunteer to take control and launch in to a certain suicide mission, only to emerge victorious. It looks like the only test match I would be able to watch if I were to be able to go to South Africa would be the 2nd test match of the series at Durban. This led to us talking about Andrew Hudson top scoring for South Africa in the opening test match of the 1996/97 series in Durban and India getting obliterated by Allan Donald. It was also the test match during which I fell out of a bus in Chennai and my head hit the curb and I passed out with a concussion. Some Good Samaritan put me in a taxi and took me to my sister’s house. As I was coming around, I wanted to make sure I had not lost much time and I asked this stranger whether it was still the first day of the Durban test match. He gave me the look as If I was speaking Greek and I came to know much later from my sister that this guy had told her that I had gone completely mental. Anyway, coming back to Herman — When he was away, he and his wife had a baby boy, Noah, who now is 20 months old. 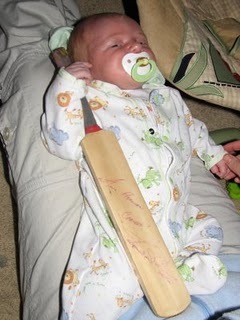 As any sane Cricket fan would do, Herman put an autographed cricket bat in the hands of Noah few days after he was born. Herman always said, “I know the kids growing up in the U.S. have a lot of choices when it comes to sports. I just want to make sure my son makes the right choice”. Good man. Oh by the way, the cricket bat – signed by none other than the great South African bowler, Fanie De Villiers. (We spent another few minutes raving about that spell of Fanie like some school girls talking about Robert Pattinson!). He tried to identify the cause of the problems and why his team may have failed to get to the semifinals. “We need to find out exactly why they were so under par, and what can be done to improve the situation,” Andrew Hudson, newly-appointed convenor of selectors, was quoted as saying by the Sport 24 website. After accomplishing the first step (as easily as they were expected to) in regaining the T20 world cup trophy, India were on to sussing their strengths and weaknesses, against an equally strong South African team, who should be among the top 3 contenders for the cup, on Sunday May 2, 2010. India had a setback before the toss, with Gautam Gambhir declared unavailable due to diarrhea. Also, they rested Zaheer Khan, which meant, India went in with a spin heavy attack and a brand spanking new opening combination (both bowling & batting).